Soundcraft have been a major player in the live sound mixer market for as long as I can remember, so the introduction of a new ‘all in one’ stage box, mixer and recording system back in January was welcome. The Ui24R is the big brother of a small family of Ui models (Ui12 and Ui16 also available) and as the name suggests, it provides 24 channels of audio inputs and eight aux outputs (for stage foldbacks) plus a stereo main output to send to the PA system. All of the gain control, mixing and routing is controllable from up to ten separate tablet, phone, PC, Mac devices via iOS, Android, Windows, Mac OS and Linux browsers, either via Ethernet or wirelessly. Thanks to HTML5 compatibility, the entire system can be controlled from any of these browsers without installing any apps. The unit even has its own dual-band WiFi so you can control the whole system without relying on an independent router or the venue’s WiFi. This is as close to a one box live sound solution as I’ve ever seen. Every piece of audio can stay local to the side of stage and the musicians can (if they choose to) set their own foldback mixes, and as for the FOH mixer, well they can be sitting anywhere in range of the Ui24R’s WiFi transceiver. This could herald a whole new era of mixing from the bar! And if WiFi control is just one step too far, the Ui24R can support keyboard, mouse and screen without requiring a host PC. Let’s have a look at the hardware in more detail. It’s clear the Soundcraft’s ability to draw on expertise from other members of the Harman group is evident within the design. The 24 inputs include 10 mic/line combo sockets, 10 XLR mic inputs, and a pair of phono inputs (some things never die!) and two digital mix channels which we’ll discuss later. Within the channel path, the preamps are from Studer, reverb is provided courtesy of Lexicon as are the choruses and delays, and finally dbx offer up the compressors. And if that’s not enough, there are two channels of DigiTech guitar and amp modelling (two of the input jacks can switched to hi-Z) so you can cope even if the guitarist forgets to pack his amp! The eight aux outputs are on XLRs, as are the main outs, which are also doubled up on ¼” jacks. 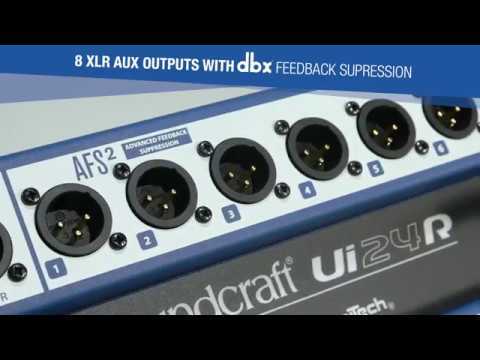 Dbx AFS2 automatic feedback suppression is available to switch in on all aux/monitor outputs. And there’s a pair of headphone jacks with a shared level control. And what about the multi-track recording facilities? Couldn’t be easier … just pop a USB memory stick into a dedicated USB port and you can record the stereo mix plus all of the 22 analogue inputs to the mixer (post A/D of course) or you can record these into a connected computer. A further dedicated USB socket allows both stereo and multi-track playback. Multi-track requires a USB 3.0 compatible stick (or USB 3.0 equipped PC) with a transfer rate of at least 25mb/s. The Ui24R is equally at home as the centrepiece of a multi-track recording studio, with easy integration between yet another USB audio interface, providing a 32 x 32 USB audio interface with CORE Audio and ASIO drivers, and the user’s PC/Mac and DAW of choice. I was impressed with the care Soundcraft have taken with regard to screen based control system which has been designed to offer different screen sizes; the small-screen version is optimised for phone-sized devices and the large-screen version for tablets and computers. The screen layouts have been sensibly designed not to cram too much into one screen. This means confidence in use even if it means a fair number of screens to select from. With ten control devices possible, I can’t see any issue with having two or three iPads in use so you can leave each in a dedicated function mode, so maybe one for main mix, one for monitor mix duties and the other to ride a particularly troublesome channel. And if you want a large control screen, full support for a large touchscreen is included via the dedicated HDMI connector. Overall it’s one of the best designed control screen layouts I’ve seen and a reflection of Soundcraft’s extensive experience in the live sound marketplace. And it all fits into one stagebox-sized rackmounting 4U case. I must admit I did a double take when I checked the price on-line. At the time of writing the Ui24R can be purchased for £869 €1,025 $995. I think this is an absolute bargain for the facilities provided in a truly self contained digital mixing and multi-track recording system. It’s big enough in terms of I/O to cope with most club touring bands and takes all the hassle out of mixing from less than ideal positions. And as a great bonus, the band can take away a pristine multi-track recording of the whole performance. Fantastic gear! You can check out the full spec on the Soundcraft website here or there is a nice intro video below.